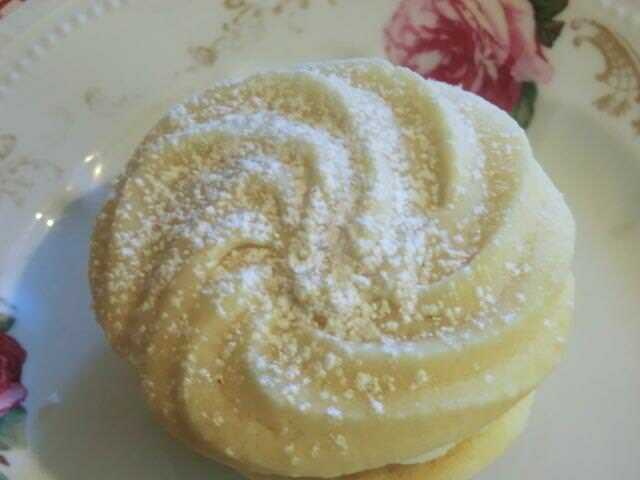 Viennese Whirl Cookies | Cooking is Fun … Really!! I don’t remember eating a lot of desserts growing up … crepes, cream puffs, apple strudel, walnut torte with chocolate butter cream icing. Occasionally, my mom would make small crescent shaped cookies with ground walnuts in the dough. It may have been because she just wasn’t that fond of sweets. My dad, on the other hand, had a great sweet tooth. Unfortunately he didn’t bake so desserts were a rare event. Over the years, I’ve expanded my dessert repertoire, and recently, UK/British ‘biscuits’ or cookies have become a small obsession. 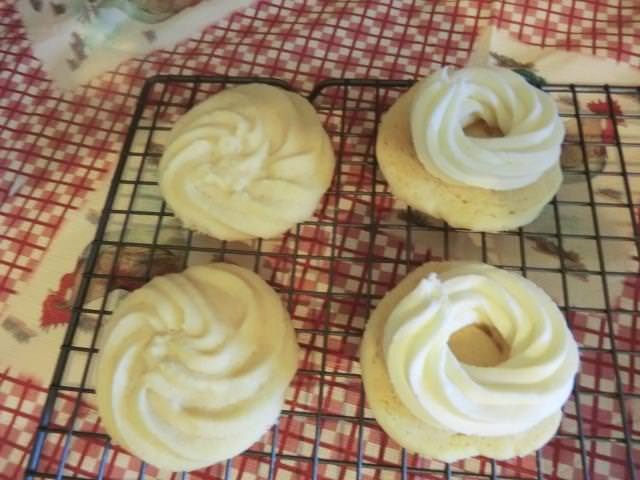 After some previous successes, I’m iffy on the the most recent biscuit … Viennese whirls. I think it was the ‘idea’ of the cookie that inspired me. 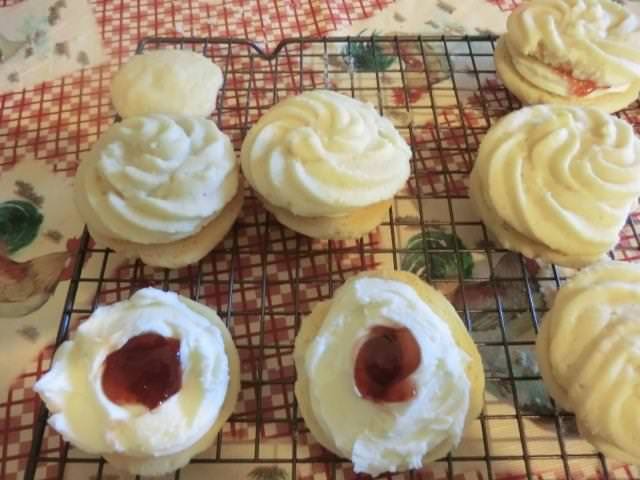 Tender shortbread cookies piped into a swirl and baked and then a butter/icing sugar filling and raspberry jam was sandwiched between two of the cookies. I did some research, watched a few videos, picked a nice simple recipe and made a batch this weekend. There were challenges in piping the dough which was quite stiff, even after I added some milk. And the cookies used up a LOT of the dough. I was able to pipe sixteen cookies, with which I could only make EIGHT sandwiches. The dough spread on baking so that the two inch cookies I piped out ended up about three inches in diameter. 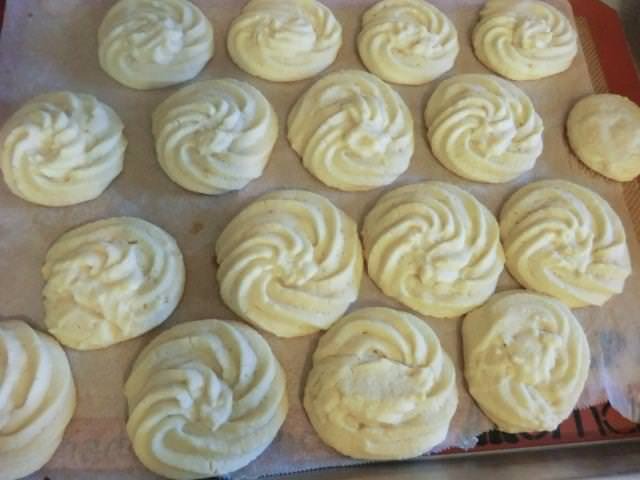 (PS: I had to increase the baking time of the tray of cookies to 20 minutes, because the tops/edges of the cookies remained pale, even after 15 minutes. The underside was a light golden brown by the end.) Handling the cookies was a challenge too since they were so tender and crumbly that the edges broke off when I tried to move them. Which made filling the cookies a nightmare. When I tried to press down the top cookie to make a sandwich … it crumbled. 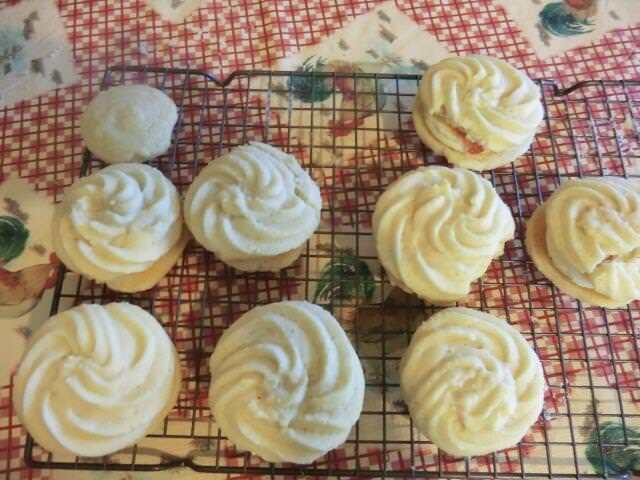 By ‘smooshing, the buttercream filling down with an offset spatula, I managed to assemble a half dozen, more or less, nice looking cookie sandwiches. The cookies themselves were barely sweet but the filling made up for the lack. The jam (I used the last of my strawberry jam since I didn’t have any raspberry) almost seemed tart in comparison. I sifted icing sugar over the top, since that’s a feature of the cookies, but it’s NOT necessary. REVIEW: The cookies are edible but, to be honest, you can barely get through one because they’re so BIG. And sweet. I’m sure they’d be appreciated by a lot of people. They just weren’t to my taste. In conclusion, if I were to make something similar again, I’d try a different recipe and technique for making the cookies. The round ‘mound’ (top left in the picture directly above) I made using the dough scraps spread nicely and was a tasty nibble. No piping or filling necessary. 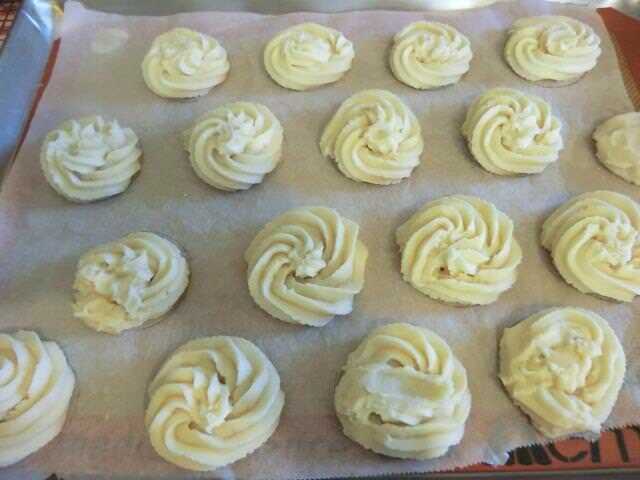 If piping, small (1 inch) rosettes might work as they’d spread during baking, resulting in much smaller and thinner cookes to construct the sandwiches with. A recent post on FB resulted in the suggestion to reduce both the flour and the cornstarch by 25 gm each. It looks like you’ve done a lot of very delicate work to make these huge, but lovely cookies. I am sure they are delicious, regardless of their size! I do the same, and I hate this piping bag business. I do so much better with old fashioned injector and different attachments. I have an injector but the tips for it are limited in number and size which is why I bought large metal ones which only work with piping bags. Fortunately, I have a real old-fashioned one, with large tips or all kinds. Walnuts in biscuits remind me of my Mum’s shortbread in which she would add crushed almonds. Here’s a recipe similar to the ones my mom made. I wonder if these were originally a spritz cookie which would make sense if the batter was stiff, the cookie press design would make it much easier to “pipe”. Plus they would only be about 5 cm diameter max. They do look very pretty though. My mom baked infrequently too, probably because she wasn’t a huge sweet eater either. I started baking around 12 and like you, I started with Canadian recipes. That Christmas, my brother gave me a sweet cookbook, which he inscribed, “This present is really for me, in the long run.”! I made a number of bars from this cookbook, almond bars (a blondie with caramel coated almonds on top) and peanut butter bars with chocolate drizzle that the family loved! I have made them for my Christmas baskets and each time they bring back wonderful memories. I haven’t heard of these, but they look beautiful (even though I’m not a fan of very sweet sweets, like you!). I always appreciate your honesty when a recipe doesn’t turn out to your liking. I didn’t grow up having desserts either. I find lots of dessert recipes today to be very sweet…I’ll take tart and lemony over sweet and gooey. Sometimes I adjust (if possible during the bake) and post the new version of the recipe. But this time, I just wasn’t motivated to repeat the recipe.